Sometimes, when you want a break from wheat and gluten, you can enjoy a variety of delicious dishes that harken back to the days before wheat was grown in the Americas. 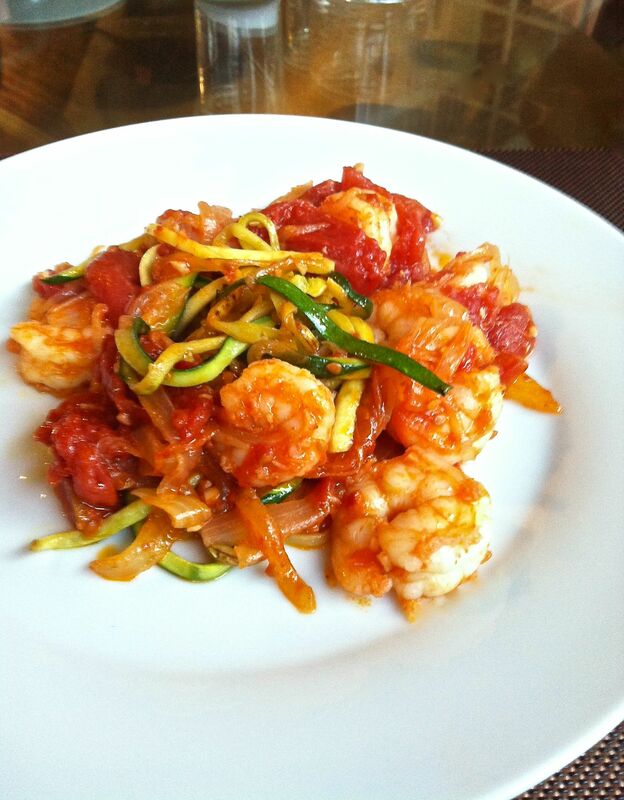 This is one of them: Shrimp with Tatuma Squash Noodles, “Camarón y Calabacita.” The basic ingredients are all native to the Texas Mexican region: tomato, Tatuma squash, chile, salt and Texas Gulf shrimp. Onion, garlic and yummy olive oil, as ingredients arriving in the 1600s, chime in to make this a delicious dish for company. I use Chile De Arbol because of its light, subtle flavor. Slow cooking the onions releases the sugars and adds a sweetness to the bite of the tomato and the mild chile (remove the seeds.) You’ll find Italian dishes that are a variation of this original Mexican dish, like the delicious Pasta Fra Diavolo, named after an Italian opera, spicy and rogue. This “calabacita” dish is only slightly spicy and certainly not rogue. 1. Heat a large, deep sauté skillet over medium heat and add 1/4 cup olive oil and the sliced onions. Lower the heat to low and cook the onions, uncovered, until they are very soft and translucent but not browned, about 20 minutes. 2.Slice the Tatuma squash, lengthwise, into 1/8 slices. Then, holding the slices together, on top of each other, slice them again, lengthwise, making long 1/8 inch square strands. Set aside. 3. Add the tomatoes and chile and 1 tsp salt to the onions, raise the heat to medium high, and cook, uncovered, for five minutes. The mixture should be soupy and watery. If it is too dry, add 1/4 cup water. Bring the mixture to a boil. 4. Add the minced garlic and cook for one minute. NOTE: You can do this up to 6 hours before your party. Hold both the tomato and the squash in the fridge until you are ready to finish the dish. 5. When the tomato mixture is boiling, add the shrimp and cook, uncovered, for about 3-4 minutes until the shrimp become bright white and just opaque. Stir as necessary. Don’t overcook the shrimp because they will become rubbery. Adjust the salt. 6. Heat a skillet over high heat and add 2 Tbs EVOO. When the oil begins to shimmer, add the squash, 1/2 tsp salt, and cook until the squash is tender, stirring to insure even cooking, about 7 minutes. Place a mound of the squash on each plate and top with the shrimp. Serve immediately. Hi, Troy. How nice to msg here! I hope you are well. Please let me how the shrimp dish turns out. Best wishes. Adan, love these recipes. I’m going to try the Camaron con Calabacita Take care .Congratulations on the wonderful book. Troy Rodriguez Port Arthur Texas.